Since 1978, ServiceMaster by T. A. Russell has been serving Azusa, CA and Los Angeles County and during that time, we have developed our business into one of the top Disaster Restoration businesses in the country. We have recently won the Marion E. Wade National Award for outstanding Disaster Restoration within the nationwide ServiceMaster family. The T. A. Russell franchise is dedicated to giving exceptional customer service throughout the actual cleaning and restoration process. Owners Todd Russell and Bruce Mason also own two other franchises in Albuquerque and Las Cruces, New Mexico. When fire, smoke, water, or mold unexpectedly damages your home, the first step you take could mean the difference between a small cleanup and a more costly and time consuming restoration. Knowing when to call a professional can also save you time in getting your life back to normal and money by preventing further damage to your home. The restoration professionals of ServiceMaster Restore by T. A. Russell will do the job right to help return your home to normal as quickly as possible while restoring your peace of mind. DON’T WAIT. For emergency services call (626) 386-8834. If you are not sure if your problem is serious and needs professional help please don’t hesitate to contact our office and ask about our FREE MASTER CHECK Program. Water damage is a common problem because it can be caused by pipe leaks, excess moisture, rain, and flooding. A small water damage problem can turn into a major problem if it is ignored which makes it important to call ServiceMaster by T.A. 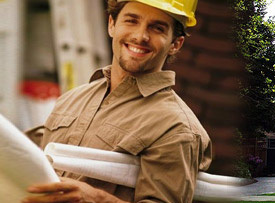 Russell for water damage restoration in Azusa, CA. Our three phase approach includes quick emergency response, water removal and drying, and reinstallation and cleaning of all structural elements and furnishings. We make sure to respond within 2 to 4 hours of your call to limit the damage. Fires are very serious disasters and once the flames are put out, the damage can continue to spread and eventually cause structures and furnishings to become unsalvageable. Calling ServiceMaster by T.A. Russell as soon as the fire is out is the best way to limit the spread of the damage and start to get your home or building back to normal. We provide fire and smoke damage restoration services in Azusa, CA and the surrounding areas. Our technicians will restore your home or building and salvage your personal belongings with our content cleaning and pack-out services. Mold can grow just about anywhere if it meets the right conditions and it causes several problems such as property damage, bad odors, and even health problems. Mold spreads rather easily once it starts growing making it important to take immediate action. ServiceMaster by T.A. Russell provides mold remediation services for homes and businesses in Azusa, CA. We work with nationally recognized testing facilities to provide inspections, lab analysis, and complete mold removal. Some disasters cause so much damage that more than just the building and furnishings are affected, the damage can also extend to personal belongings and keepsakes. Just like with your home or building, your personal belongings must be cleaned and restored immediately before they become unsalvageable. ServiceMaster by T.A. Russell provides content cleaning and pack-out services to help homeowners in Azusa, CA clean and restore their belongings that have been damaged in a disaster. If your content cannot be properly restored on-site, we will take them to our secure facility as part of our pack-out service where they will be cleaned and stored until you are ready to take them back. There are several types of disasters that can cause foul odors to hang around a home or building and these odors are often challenging to eliminate. ServiceMaster by T.A. 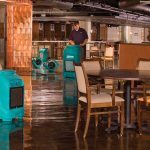 Russell provides deodorization services for homes and businesses in Azusa, CA to remove a variety of lingering odors from the structural elements, furnishings, and air space within the building. We use a variety of proven deodorization methods such as hydroxyl technology and thermal fogging to remove odors caused by water damage, mold, fire and smoke damage, and biological substances such as animals and bodily fluids. Hoarding is a disorder that can have serious implications if the symptoms are left unchecked, leading to unsafe and unsanitary living conditions. ServiceMaster by T.A. Russell provides hoarding cleaning services in Azusa, CA to help individuals that struggle with hoarding issues clean out their homes and return them to a sanitary condition. We are trained to handle anything we may come across including foul odors, biohazard materials, and dead animals with our three step cleaning process that includes decontamination, deodorization, and proper disposal. Once the confusion from a disaster settles down and everyone is safe, the top priority is to get your home or building rebuilt as soon as possible. Many types of disasters can cause devastating damage and ServiceMaster by T.A. Russell provides construction services to help rebuild heavily damaged homes and buildings in Azusa, CA. Our technicians can rebuild several types of buildings including private residences, high-rises, multi-tenant buildings, and retail stores among others. We will manage the entire construction project and openly communicate with you every step of the way. When a disaster occurs in an office or commercial space, the amount of damage and the time spent repairing the damage can cost a company a lot of money. Reacting quickly to serious damage in your office or building will not only save money in repairs, but also limit the interruption to your normal activities. ServiceMaster by T.A. Russell provides commercial disaster restoration services in Azusa, CA to help local businesses that have sustained damage in a disaster. 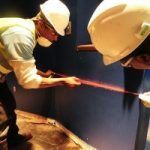 Our technicians are trained and equipped to handle large and small losses in any commercial setting and we will also restore safe working conditions by improving the indoor air quality. It is never easy to face a scene involving a serious accident or violent crime, but you must know how to react for your own protection. These scenes generally contain biohazard materials like blood and bodily fluids and if you encounter or mishandle these materials, you may put yourself at risk of a disease or infection. It is best to call a professional to handle the cleanup after calling the appropriate emergency responders. ServiceMaster by T.A. Russell provides biohazard and trauma scene cleaning services to safely clean and restore such scenes in Azusa, CA. Our technicians will come equipped to safely remove biohazard materials and clean the scene, and we will also treat those grieving a loss with compassion and respect.